Day 2 was less dramatic because I knew what to expect, although no less intense—but not hard at all. I took myself out for breakfast and ordered the exact same thing as the day before (scrambled eggs, hash browns), since it seemed to work well. I watched through the diner window as people sped past to get to work, and felt suddenly swept up in routine, as well. Except my work for the day happened to be donating stem cells. I left the diner and tried to get a cab, but soon realized this was impossible during rush hour. So I took a bus to the hospital, instead, which did feel strange—a little too ordinary for the task at hand. I arrived at 9AM and met my friend Y., who had graciously offered to sit with me for the day. Although they hadn't yet finished counting the cells by 9:30AM, I was hooked up to the apheresis machine just the same. The "in" IV was placed in my right arm after a few tries (my veins were not in terrific shape after a day of hard work) and the "out" in my left, as before. 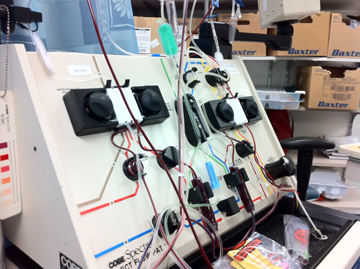 But after a few minutes the machine started to beep—my blood was not flowing through the needle. It and my arm were moved and re-adjusted every which way, to no avail. Then F., my nurse for the day, called over A., a distinguished-looking man with some sort of European accent and apparently the go-to-guy for such problems, and they decided my right arm was a lost cause vein-wise. The "out" needle would now go in my left—along with the "in," through a different vein in my hand. A nice side benefit: I would have complete use of my right arm. So IVs were moved around with very little pain (although I wasn't exactly relaxed about the whole affair), blood began flowing, and all was well. Turns out my veins weren't at fault, but rather a small blood clot at the tip of the needle site that appeared before the anticoagulant could start flowing. By then my cell count had come back from the lab; they had over half of what was needed, but decided to keep me hooked up for the full four hours. The rest of the day was just like the day before, except this time I was in a different chair situated right in the thick of things. After hour three I was again completely exhausted, but this time hour three coincided with lunchtime. Suddenly I didn't feel well—dizzy, lightheaded. Y. and the nurse reminded me to eat, and I was just fine after a few bites of tuna on whole wheat. Finally, hour four—the machine beeped "DONE", and a woman in a white coat carrying a big cooler swooped in and left with the bag of my cells. I was steadier getting up this time—my body, and particularly my left arm, had gotten used to not moving. All three donor liaisons arrived as I got unhooked, like an official farewell. I couldn't leave the hospital until my platelet counts were checked—below a certain level required that a nurse tell me officially that I shouldn't skydive, etc. So Y. and I, along with K. from the blood center, moved into the waiting room. A man sat there there as well who looked and sounded like my sort-of Uncle Ray (my mother's best friend's husband)--tall, bald, amiable and funny. We all got into a conversation about the weather. Suddenly K. stared at the man. "You're the courier, right"? she said. He nodded. (I assume she recognized his voice from phone calls.) This was the person who would hand-carry my stem cells to wherever in the world they needed to go. I don't think we were supposed to meet, and soon the conversation grew more circumspect, no mention of cities or names. C. returned with my blood counts—low, as expected. (They would be back to normal in a week.) F., the nurse, came over to remind me not to operate heavy machinery. I was glad to go home, although didn't want this adventure to end just yet—but I had the distinct feeling they were rushing me out, in case inadvertent clues were leaked about the destination of my cells. K. offered to get me a cab, and I gathered my stuff. As I walked out the door, I turned and looked Uncle Ray straight in the eye. "Thank you," I mouthed. He nodded.